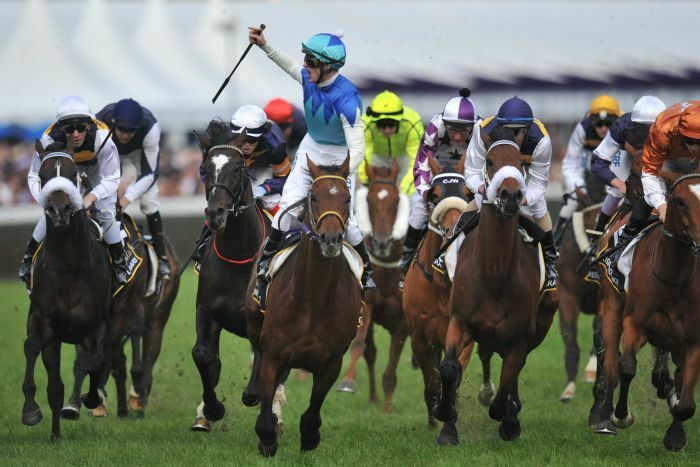 Caulfield Cup : the chances of each runner in the field. Home » Horse racing » Caulfield Cup : the chances of each runner in the field. The Wolf’s runner by runner guide of the spring carnival’s 2015 Caulfield Cup where he assesses the chances of each runner in the field. Protectionist ($41)Has shown no zip in his three starts this spring and looks desperate for two miles. Looks only a shadow of the galloper that blazoned to victory in last year’s Melbourne Cup. Snow Sky ($11)Has come into his own as a four and five-year-old. Beat Brown Panther three runs back before taking the scalp of Eagle Top in the G2 Hardwicke Stakes. He disappointed in the King George at his latest outing but that was put down to the wet track. Loves dry tracks, drawn well, Ollie on and has the tactical speed to use his good gate. This looks a more suitable assignment for him than the Melbourne Cup so expect him to be tuned right up. Key player. Fame Game ($11)One of the best-credentialed imports to hit our shores. This Japanese-based six-year-old ran an outstanding second in the G1 Tenno Sho last start behind the world class stayer Gold Ship. Has a CV superior to that of last year’s Caulfield Cup winner Admire Ratki which is worrisome for his rivals here. However, is a genuine two miler and one that likes room so 2400m and barrier 1 are two big negatives. Our Ivanhowe ($26)Already a two-time Group One winner in Germany, this six-year-old showed a glimpse of what he is capable of in the Bart Cummings in running second to Let’s Make Adeal with 60kg on his back. Reasonable to assume he’ll only come on again from that. The barrier does him no favours but don’t discount him running a monster race. Hokko Brave ($13)Not as well credentialed as Fame Game – he ran sixth in the Tenno Sho – but does get a slight weight relief from him. Drawn wide may be an advantage as his connections are adamant that he does his best racing when he has room to win up being a big-striding horse. He might be the second stringer but don’t discount him as his CV is still very good and would have Delta Blues and Pop Rock covered. Mongolian Khan ($4.80)The Australian Derby winner has had a perfect Caulfield Cup preparation. Put the writing on the wall in the Caulfield Stakes, charging last to run third behind Criterion. There is a lovely sense of timing about this four-year-old and he’s drawn perfectly to get a midfield trail. Deserved favourite but no value at the price. Trip To Paris ($26)Won the Ascot G1 Gold Cup three starts back over 4023m so his staying ability is definitely not in question! What is in question though is whether he is sharp enough to win over 2400m. Unlikely. Melbourne Cup looks more his go. Will be warming up late. Who Shot Thebarman ($26)Loved the way he has attacked the line in his three runs this campaign. He’s right on track for the Melbourne Cup. As far as his winning chances here are concerned, he’s a big track horse so Caulfield won’t suit and the barrier means he’ll be giving a massive start. Grand Marshall ($34)Not dissimilar to Who Shot Thebarman, in that he is sticking over perfectly for his grand final the Melbourne Cup. Barrier 6 gives him the tactical advantage over his stablemate but the query is whether he has the sprint over 2400m to match it with some of the elite 2400m horses in this race. Royal Descent ($15)Boxed on bravely to run fifth in the 2013 Caulfield Cup. Is a fully mature six-year-old now and is in career-best form. Was just nutted by Preferment in the G1 Turnbull at her latest outing. The Wolf thinks the mile is her best trip but she’s so incredibility honest that you can’t leave her out of any exotics. Bossy should be able to offset the wide draw with a positive ride to sit on the speed. Volkstok’n’barrell ($21)Convinced he is going better than his form suggests but unlike Mongolian Khan, nothing has gone right this spring. Raced in restricted room in the Makybe Diva while last start he folded up quickly after leading up the Turnbull field. A fading ninth is hardly an ideal tune up for the step out to 2400m. Hauraki ($8.50)Jumped out of the ground out to a trip in the Craven Plate, when outgunned by Complacent. There was a huge gap back to third. Wants the 2400m now and J-Mac/O’Shea flying. He lost a leg when he raced in Melbourne last which has to be a huge query going into this. Better on his Sydney leg? Otherwise, a good hope. Lucia Valentina ($31)Ran third in last year’s Caulfield Cup which points to her having some chance again this year but this edition is much stronger. Was just an even run in the Epsom, when racing like she wants further. Gets that here but would need it wet to be a genuine winning hope. Rising Romance ($10)Ran second in last year’s Caulfield Cup on the back of a masterful ride from J-Mac. Gets in on the same weight this year and drawn to get the run of the race. Put a pen through her Turnbull failure as she was posted throughout. Best go off her excellent second to Fawkner the start prior. Leading chance. Magicool ($101)Had excuses his first couple of runs this prep but he was horrendous in the Turnbull. Gust Of Wind ($16)Her form reads 9th, 8th and 11th but that doesn’t do her justice. Has been working home nicely and looks ready to explode over 2400m. Wide draw is a plus as she be afforded the chance to peel to the outside and rip home. Drops to 51kg and gets the services of gun flyweight Chad Schofield. Last year’s Oaks form stacked up in the Caulfield Cup. Expect the same this year. Set Square ($9.50)Was left flatfooted at Flemington second-up but bounced right back in the Turnbull, running third. She was held up in the straight so a case can be made that she should have been fighting out the finish with Preferment and Royal Descent. Down on 51kg she also has a strong case. Booked her place in the field with a narrow Naturalism win over The United States, who definitely wouldn’t be $51 if he got the bob instead. Was beaten by Escado last start but the track was a Firm 2! That’s the minor case for. Against is the class of race and query over running a strong 2400m.